Posted on 29, January 2016 by EuropaWire PR Editors | This entry was posted in Apparel, Fashion & Beauty, France, Travel and tagged A380s, ANA Holdings, Fabrice Brégier, Japanese airline. Bookmark the permalink. 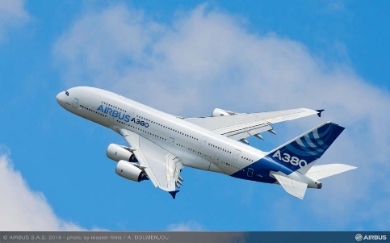 PARIS, 29-Jan-2016 — /EuropaWire/ — ANA Holdings has signed a purchase agreement with Airbus covering the firm order of three A380s. With this milestone order for Airbus, ANA Group has joined the customer base for the world’s largest passenger aircraft and will become the first Japanese airline to operate the type. ANA Holdings’ new order follows a recent order placed in 2014 and 2015 for 37 A320 Family single aisle aircraft. Designed for the challenges of the 21st century aviation industry, the A380’s unique size allows airlines to maximize their revenue potential through an optimized cabin – boosting their contribution to profit by up to 65 per cent per flight compared to its nearest competitor. Its unbeatable passenger experience leads to higher load factors and more revenue, for higher profitability. The A380 carries 544 passengers in a typical comfortable four class configuration on routes up to 8,200nm/15,200km. From Tokyo this enables non-stop service to the US as well as to destinations across Europe. Including the ANA Holdings’ order, Airbus has now received a total of 319 firm orders for the A380 from 19 airlines worldwide, of which 179 A380s have been delivered to 13 world class airlines. Currently, A380 is operated on over 100 routes to 50 destinations.